Emory University’s Nell Hodgson Woodruff School of Nursing is once again among the top five nursing schools in the U.S. for funding from the National Institutes of Health (NIH). In 2017, the school received $7.8 million in NIH funding as part of a total portfolio of $14.9 million. This includes 20 NIH research awards, among which six were training and/or career development awards. 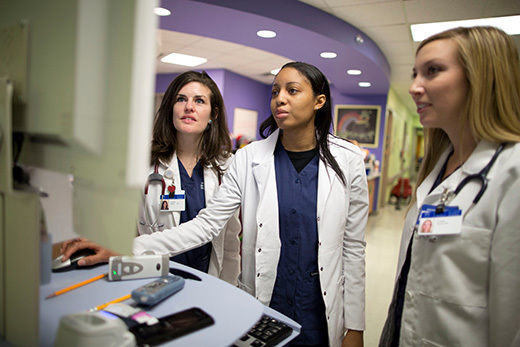 The School of Nursing’s transformative research is reflected in several current projects. This trend marks a notable uptick in NIH funding from under a decade ago when the school was 38th in funding in 2009. The Subgingival Microbiome in Non-Hispanic Black Women: Relationship to Periodontal Inflammation, Systemic Inflammation, and Preterm Birth is designed to characterize the bacteria that live under the gums of pregnant non-Hispanic black women as a first step toward better understanding the link between gum disease in preterm birth. Preparation for End of Life Decision Making in Mild Alzheimer's Disease will adapt and pilot test an efficacious Advance Care Planning intervention, SPIRIT (Sharing Patient’s Illness Representations to Increase Trust), with patients with Mild Alzheimer’s Disease and their surrogates to promote open, honest discussions while such discussions about end-of-life care are possible. Metabolomics of Labor Dysfunction in African-American Women will study small molecules utilizing high-resolution metabolomics to identify metabolic profiles that differentiate obese, African-American Women with labor dysfunction and reduced response to oxytocin, a medication that is used to help speed labor The purpose of this project is to promote health, prevent disease, and eliminate health disparities through a better understanding of biomarkers associated with Labor Dysfunction in African-American, obese women.